Raffles Farm principals are noted for their astute planning. A plan came together at Avondale on Wednesday with a first-start maiden and tomorrow week, an even more ambitious plan may come together at Riccarton. English import Pico Turquino justified her solid support to make a dream start to her New Zealand career at Avondale on Wednesday. The well-related Teofilo mare had finished runner-up at the trials last month and impressively went one better to score on her raceday debut over 1200m in the familiar Raffles Farm colours. Tomorrow week a slightly riskier but nevertheless, well thought-out plan, is set to reap rewards and buck the trend of Kiwi stayers plundering Aussie spoils. The Danny O'Brien-trained Rock Vantage landed in Auckland last week from Melbourne on a mission to win the Group 3 New Zealand Cup (3200m) at Riccarton. The risk factor in this particular plan is that the Rock Of Gibraltar five-year-old entire isn't guaranteed a start. He's 21st in the order of entry into the 18-horse field but Raffles have taken the punt that he'll gain a start in the staying feature. "We're a bit concerned about that," Raffles Farm manager, Bruce Sherwin said. "It will be a bit of a disaster if he fails to make the field." Should that happen he will find an alternative in a $40,000 R85 2500m race on the same programme, a race won last year by Melbourne Cup placegetter Who Shot Thebarman. Lightly tried by O'Brien, Rock Vantage has won four of his 17 starts and amassed nearly A$100,000 in stakes. 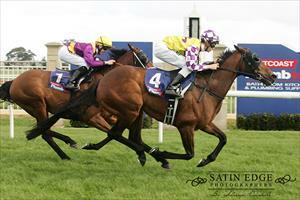 His most recent run was over 2500m at Moonee Valley on October 31 when he ran fourth to Averau. His previous run over 2238m at Sale produced a win, pictured, and his consistent form over ground saw him run third at Geelong the start before over 2200m and second at Bendigo over the same distance before that. He has had a slow, well spaced six race build-up to the NZ Cup since he came back into work in June. "He's a lightly raced progressive type," Sherwin said. "This race has been been in mind since the start of his preparation and, in fact, was discussed when he went for a spell at the end of his previous preparation." Rock Vantage will spend the next few days at Stephen McKee's Ardmore training complex before heading to Riccarton where big race jockey, Vinnie Colgan, has been booked to ride him. After his race he'll then head back north to Cambridge to spell at Raffles Farm. "The horse can spell here and follow a similar sort of preparation to the one Sacred Falls had before he returned to Australia." It has been well documented how Raffles star, Sacred Falls spelled and pre-trained in Cambridge before going back to Australia to win at Gr I level.